Any links in this post to a merchant may contain an affiliate link, which means that if you click on that link and then buy something, I may earn a commission from it. However, all opinions in this link are 100% mine and 100% honest. If I didn't believe in a particular product, I wouldn't recommend it to you. The Chinese Theater has become, at least unofficially, the icon of Hollywood Studios. You will see it as soon as you enter the park. You will see a number of Photopass photographers lined up and down the street to take photos with the theater in the background. 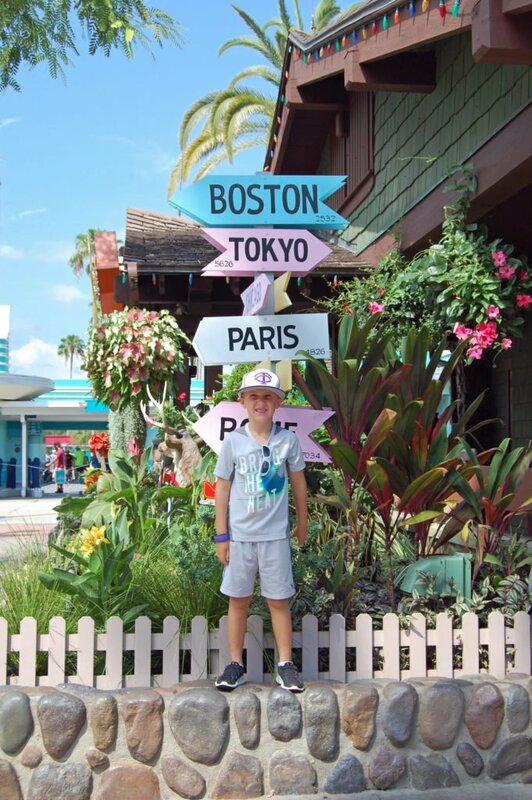 Even if it is the only photo you take the whole day, this is one you need to take on your visit to Hollywood Studios. 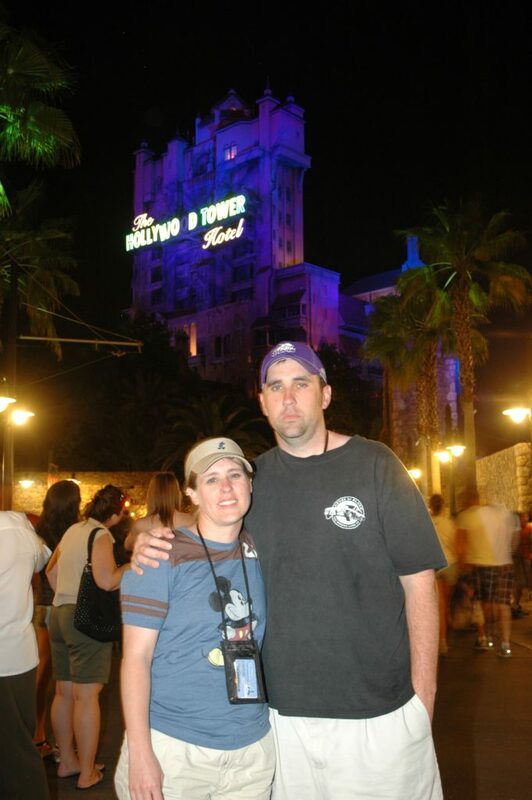 Tower of Terror is probably the second most popular place for photos in Hollywood Studios. 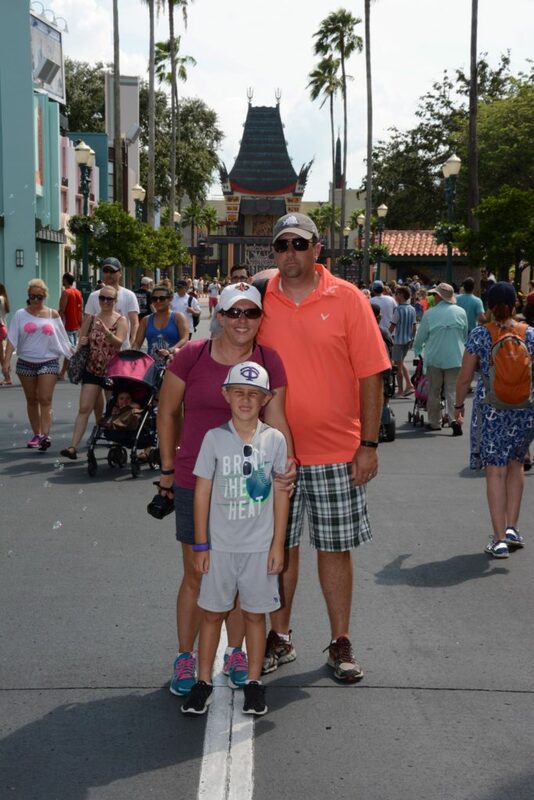 There are usually several Photopass photographers on Sunset Boulevard to take photos with the tower in the background. This is especially a great spot to take night photos. The tower, when lit up at night, is extra spooky! 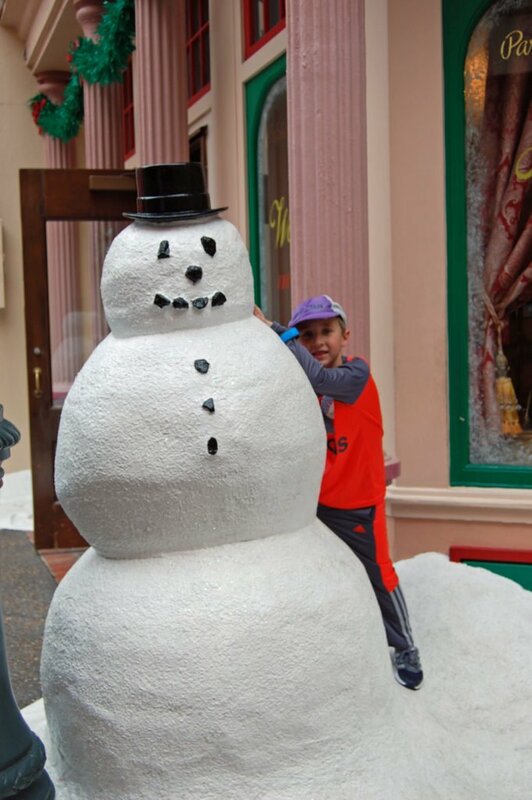 Outside of the Christmas shop, around the corner from Mama Melrose’s Ristorante, you will see a snowman. He is there all year long. He is a fun companion for your pictures. I especially love the pictures of the snowman with kids dressed in shorts and t-shirts. This is a nice place to get some photos for your next Christmas card, regardless of when you visit. 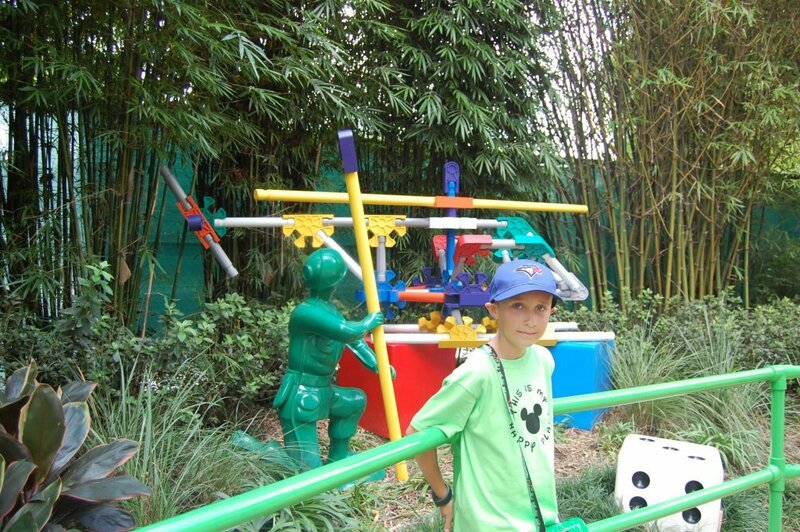 My son with some of the toys in Toy Story Land. 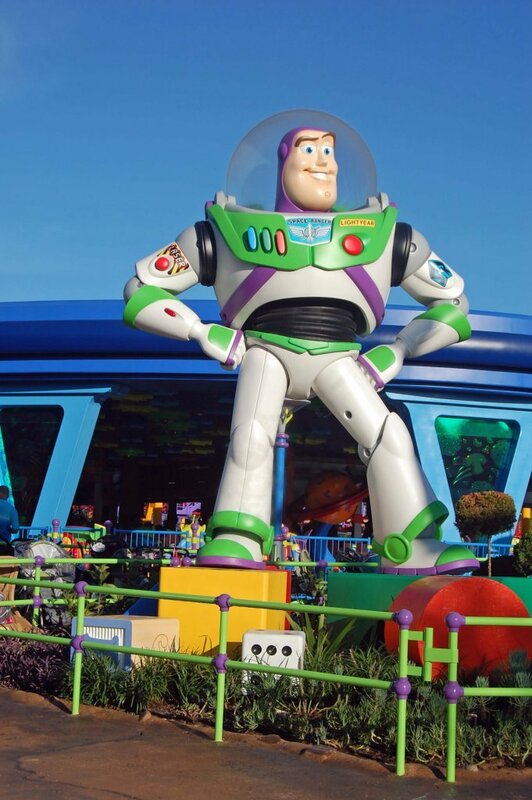 The newest land in Hollywood Studios is Toy Story Land. This whole land is full of fun areas to take photos of your family. Popular choices are the larger-than-life characters from the movies and the popcicle wall along the exit from Toy Story Mania. But, every nook and cranny of this land is great for pictures. Even the bathrooms and benches make great photo ops. In the area around Star Tours, you will find several Star Wars references. 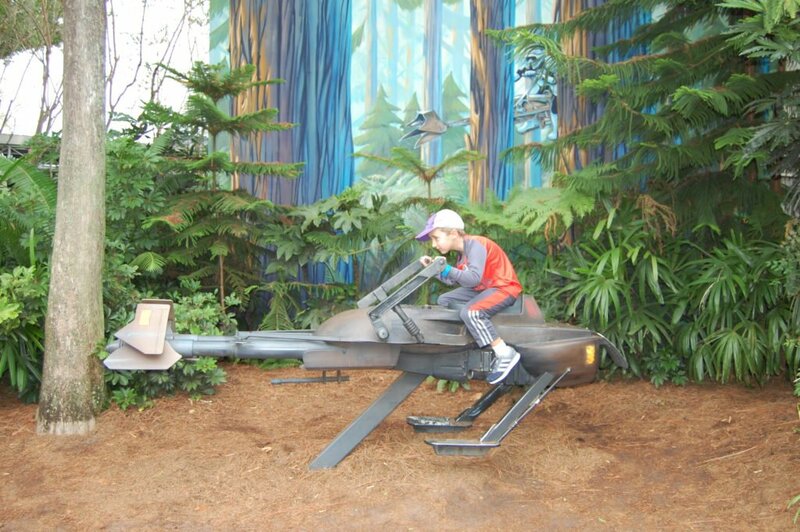 Across the path from the exit of the ride, you will see a speeder bike. It is one of the most popular spots for Star Wars inspired photos at Hollywood Studios. With the right angle, you can grab a picture that makes your family look like they stepped into one of the movies! I don’t know what the proper name for this sign is, but I think you will know what I’m talking about when you see it. Just inside the turnstiles of Hollywood Studios, look to your left. You will see a shop. On the side of the shop, there is a sign with arrows pointing to various cities around the world. This is one of our must-take photos every trip. It’s fun to look back at these photos over the years to see how much he has grown. 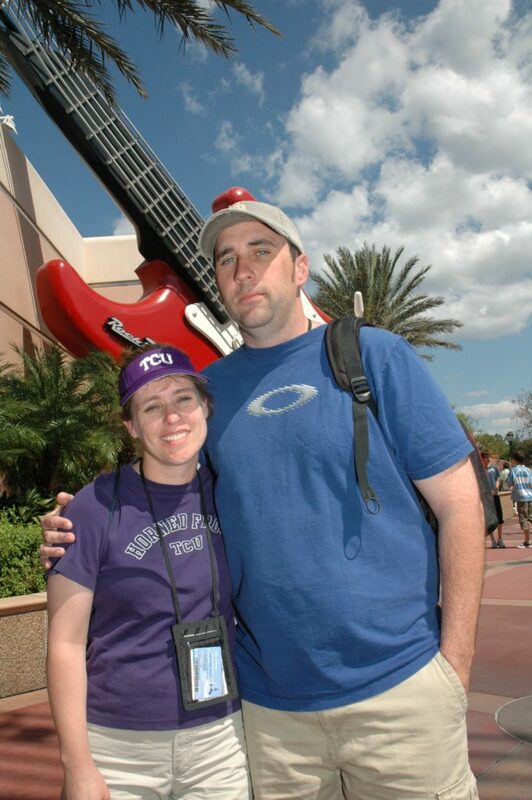 On the outside of the building that houses Rock ‘n Roller Coaster, there is a huge guitar. The guitar’s neck and strings morph into an upside down road on which a Cadillac sits. Both the Cadillac and the guitar are great places for photos at Hollywood Studios. These are really special places for pictures if you have someone in your party who is taking their first ride on the musical roller coaster. There are several places inside Hollywood Studios where you will see cars parked. The first one you will see is at Oscar’s Super Service, an old-fashioned gas station that serves as the wheelchair and stroller rental center. It is just inside the entrance on the right hand side. You can find other photo spots with antique cars along Sunset Boulevard. 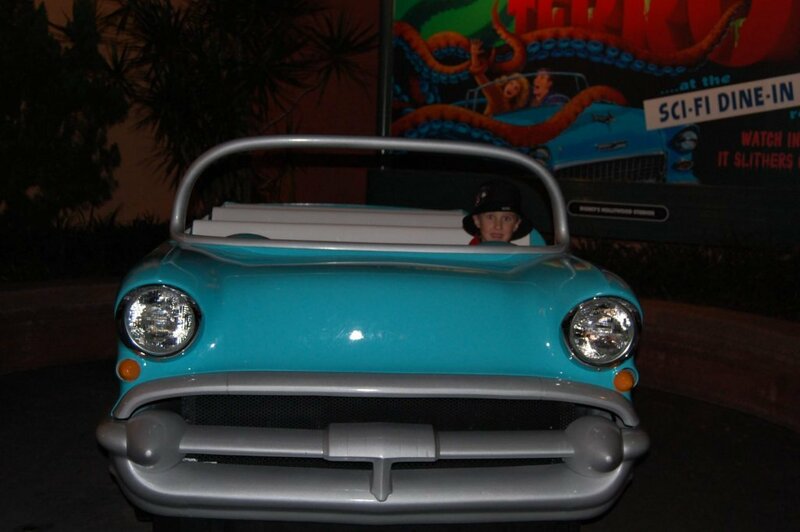 In front of Sci-Fi Dine-In, there is a convertible that also makes fun photos. These are all great places to snap some pics of the car lovers in your family. 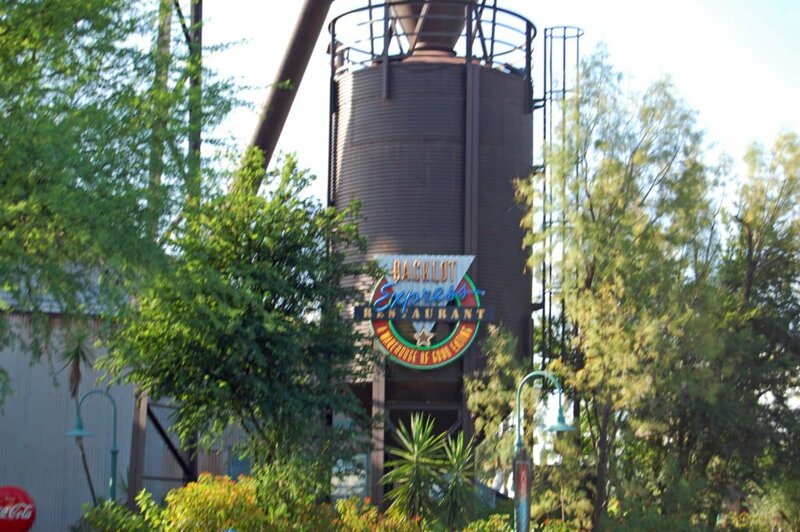 In the Echo Lake area, you will find the Indiana Jones Epic Stunt Spectacular and the Indiana Jones Adventure Outpost. 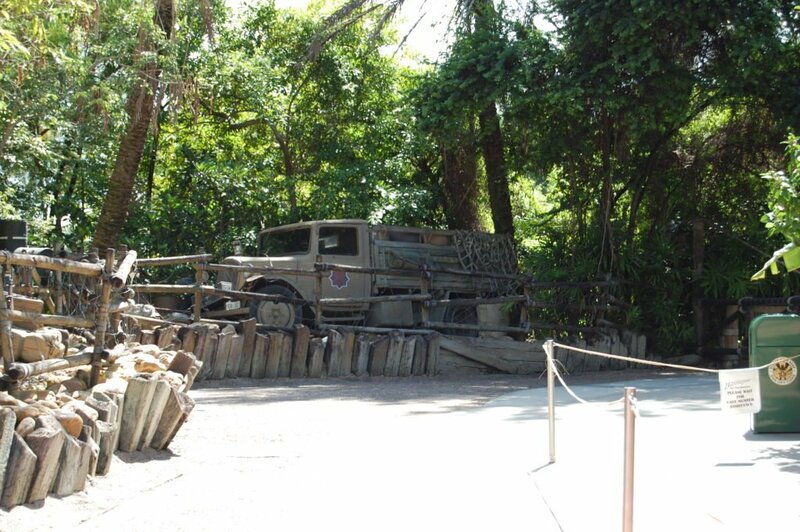 All around these two locations, you will find a variety of Indiana Jones-themed props. Taking pictures with these props can make for some unique and interesting vacation photos and memories. The entire Muppets Courtyard area is not only a nice place to hangout, but it is also rich in whimsical details that make for some really fun photos of your family. The Muppets fountain in the center of the courtyard is the most prominent feature, but look around. 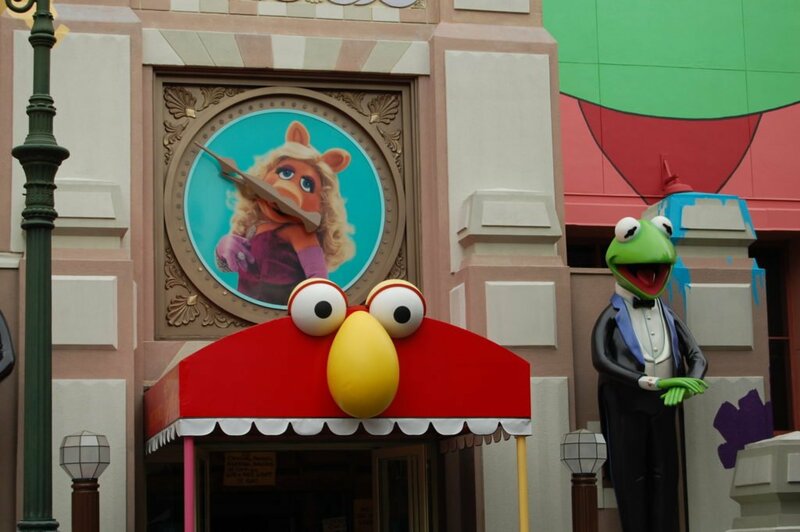 You will see lots of Muppet details throughout the area. Take advantage of them all by taking lots of pictures in this area. While park icons and popular locations are obvious choices when looking for places for photos at Hollywood Studios, don’t stop there. Look around and get creative. 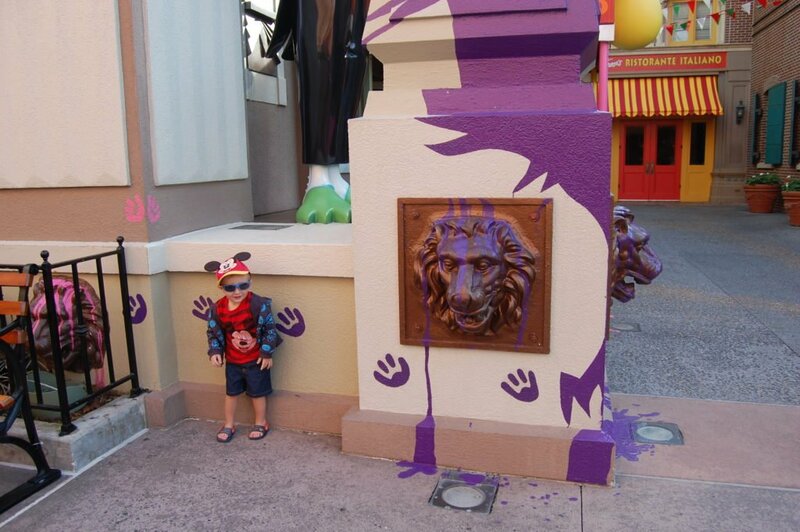 There are tons of fun and playful details throughout the park to provide you with lots of unique photos. The above list will help you find some new places to photograph your family. For help planning your Disney World trip, see my step-by-step guide, quick tips, and best resources. To book your trip, visit Disney’s website. 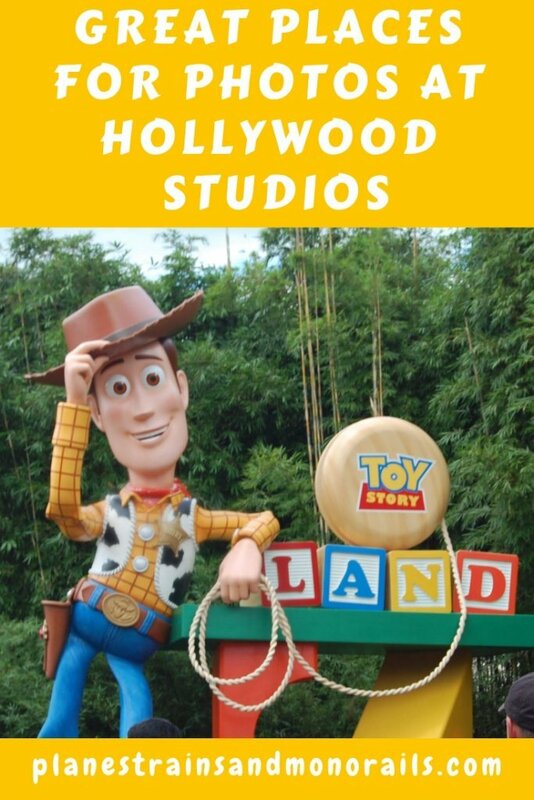 If you want ideas on things to do in Hollywood Studios, try my magical must-do’s, jedi training, and Toy Story Land posts. Happy travels! 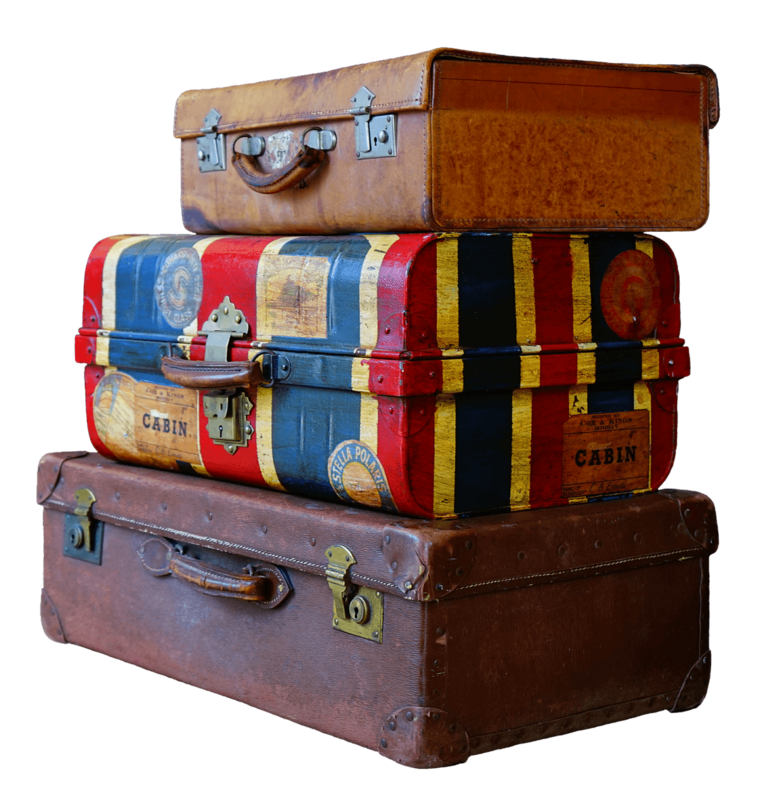 Take the stress out of packing for family vacations! Plus, don't forget to pack something ever again! Sign up for our weekly newsletter and get our free Ultimate Family Packing List. Get your packing list now! Want to make packing for family trips easier? Want a way to make sure you don't forget anything? Subscribe to our weekly newsletter and get our free Ultimate Family Packing List as our gift to you! Take the stress out of packing for family vacations! Plus, don't forget to pack something ever again! Sign up for our weekly newsletter full of travel tips and get our free Ultimate Family Packing List.